The Last Days – of What? 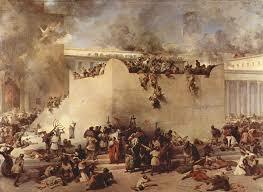 Destruction of the Temple in Jerusalem by Francesco Hayez. Depicts the destruction of the Second Temple by Roman soldiers. Oil on canvas, 1867. Ever since I’ve been a Christian, I’ve heard about how we are living “in the last days”. The belief is that we are living in the “last days” just prior to the return of Jesus Christ. While this certainly may be the case, a close reading of the scriptures indicates that the writers of the New Testament believed that they were living in the “last days”. Or that the “last days” had arrived for them. The Apostles referred to the “last days” and the “last times” in such a tone that reveals the writer’s beliefs. When the New Testament writers used the terms “last days” and “last times” were they referring to the end of the world? Or something entirely different? In the above scripture, John was linking the arrival of Antichrist with the “last time”. He clearly states that “even now are there many antichrists.” The words contained in the New Testament are not mere opinions of the Apostles and other writers. The scriptures declare that the Holy Ghost inspired these men. What they have written is inspired scripture. So were they living in the “last days” or not? The Apostle Paul wrote the epistle of II Timothy shortly before his death in A.D. 67. Paul wrote as though he was living in the “last days”. He warned Timothy about the men who were foretold to exist in those “last days.” When Paul wrote those words, do you really think he had a time in mind 2000 years in the future? Paul said that in his time “do these also resist the truth.” These resisters of the truth were alive in Paul’s generation. Did Paul have the wrong interpretation? Or was he inspired by God to declare those things? Some have given the Apostles sort of a pass on their references to “the last days”. They claim that even though, the apostles were incorrect in believing they lived in the “last days”, it was a good thing that they did. A line of reasoning proposes that every generation has thought theirs were the last generation. And that the Lord intended them to think so, for such a belief would encourage them to expect the Lord’s return at any moment. The thinking goes that if you don’t believe you are living in the “last days“, that you might grow lukewarm and backslide. And since God wants us always to be living a fiery and dedicated life for Him, He wanted every generation to think they were in the last days. At least this is the theory that is proposed. However, this implies a very dangerous idea and would defy the integrity of the scriptures. If God inspired Paul to write those words to Timothy, and they were not living in the “last days”, then God would have inspired them to write a deception. One might think it’s a good deception since it urged them to serve God wholeheartedly. However, it was a deception. Paul, inspired by the Holy Ghost, declared that men foretold to come in the “last days” were alive in his day. Would God lie in order for us to serve Him wholeheartedly? Do we not regard these words of Paul to Timothy as Scripture today and inspired of God? In this passage, Peter was saying that when Jesus Christ arrived the “in these last times” were manifested or made known. Made manifest or known, that is to these first-century believers. Jesus, the Lamb slain from the foundation of the world had finally arrived. His blood was shed for the remission of their sins. Jude epistle was originally intended to speak about the common salvation. However, the Spirit of God urged him to write otherwise. As Jude continued to write, he spoke about “certain men” who already crept into the church unawares. And he reminded them of the Exodus story and the unbelievers who were destroyed by God. Then he made mention of the angels who left their first estate and were damned. Then he spoke of Sodom and Gomorrah’s example of the disobedient being punished by fire. Jude once again pointed to men of his day. Jude is saying that “in the last time” that there would be mockers who would be carnal and sensuous. Then he clearly points out that the mockers were living in his day by declaring “these be they“! Jude made that statement nearly 2000 years ago. He was not referring to a time future to his generation. He did not say “those be they”. Peter was among the hundred and twenty that were in the upper room on the Jewish day of Pentecost. Peter, full of the Holy Ghost and under that inspiration of God preached a sermon that quoted Joel’s prophecy concerning “the last days.” Peter was telling these Jews, who were very familiar with the prophecies of the Old Testament, that what they were witnessing was the outpouring of God’s Spirit. And as proof, he quotes a passage from the book of Joel. Instead of looking ahead to the arrival of the “last days” Peter is declaring that the “last days” have arrived since God was pouring out His Spirit. This is possibly the clearest scriptural text to show that the Apostles preached that they were living in the “last days” or that the “last days” had finally arrived. Here again, the writer of Hebrews is linking the coming of the Son of God with living in “these last days”. Notice the writer didn’t say “those last days” but “these last days”. They wrote as if they believed the “last days” had arrived in their day. The scriptures declare that these men were inspired of God. Why then did they believe that they were living in the “last days”? Were they mistaken? In this letter, John is pointing out the fact that because there were “many antichrists” they would know they were in the “last time”. John was concerned that some in their group were leaving the faith. Their leaving was additional evidence that they were living in the “last time”. Of course, the question should be what “last days” or “last time” was John referring to? Was John referring to the end of the world or something else entirely? The Last Days of What? The Bible is the inspired word of God. Therefore, the disciples were inspired of God when they penned the words in the above passages. We need to “rightly divide the word” to find the correct interpretation. What’s very clear is that the disciples preached they were living in the “last days.” They were God inspired to preach that message. But that was the 1st century A.D. How could the disciples have been living in the “last days” when we are still on earth nearly 2000 years later? I believe the answer is very simple. The disciples could not have been referring to the “last days” of planet earth. They weren’t referring to the end of the world or the 2nd coming of Jesus Christ 2000 plus years into the future. There just aren’t any scriptures that show that these men are speaking of the “last days” of the planet earth. They must be referring to the “last days” of something else. The question is what was this something else? Throughout the Bible, we find God making covenants with man. The Old Covenant and the New Covenants are the two major divisions of the Bible. The major theme of the Old Covenant was that Messiah would come. The New Covenant declares that Messiah has arrived. One “age” or “time” was ending to be replaced by a new and more perfect “age”. Jesus prophesied both the destruction of the Temple as well as the city of Jerusalem in His generation. True to His word, in 70 A.D. Jerusalem and the Temple were destroyed. Jesus declared that the “end” would not fully come until certain signs would occur. He listed signs of earthquakes, pestilence, persecution and Christian martyrdom in Matthew chapter 24. He listed the same persecution in Matthew chapter 23. Jesus said that His disciples would flee from city to city because of the persecution. By reading the book of Acts, the fulfillment of these signs is easily seen. The church did suffer persecution. False prophets arose throughout the land. It is clear that the “last days”, referred to by the apostles, stretched from the day of Pentecost to the destruction of Jerusalem and the Temple in A.D. 70. This period lasted approximately forty years. A Biblical generation is commonly regarded as forty years. Peter quoted Joel’s “last day” prophecy of God’s Spirit being poured out upon all flesh. The coming destruction was signified by the prophetic language of the sun turning dark and blood-colored moon. The outpouring of the Spirit refers to the Day of Pentecost. The descriptions of the sun and moon refer to the destruction of Jerusalem in A.D. 70. That 1st-century generation would see the temple and the city of Jerusalem destroyed and the Judaic religious system come to an end. Those who rejected Christ and crucified Him would witness these events. An age was coming to a close. Notice that Hebrews 1:2 contrasts the Old Testament age with the age of the Church and mentions the term “these last days”. In other words, the “last days” were the absolute closing out of anything to do with the Old Testament and its temple sacrificial system. What happened on the cross ended the time of the Law and the prophets. During Jesus’ crucifixion, the temple still stood but would soon be destroyed along with its city Jerusalem. According to the Apostles, the “last days” refer to the time frame between Christ’s cross and the destruction of Jerusalem and the temple in A.D. 70. These apostles were not merely writing words based upon their erring opinions of when the “last days” would occur. They wrote, inspired by God, regarding the temple’s destruction, as well as Jesus’ prophecy regarding Jerusalem’s destruction. What makes more sense and agrees with the inspiration of the scriptures? That God inspired the apostles to believe incorrectly that they were living in the “last days”? Or, that God inspired the apostles to write about the “last days” of the temple’s existence and the Jewish religion? And when the time came Christian believers in Jerusalem would flee to the mountains and be safe from the devastation? We now have seen that the “last days” of the temple and Jerusalem certainly occurred during the days of the early church in the first century A.D. Finally, let me end this article with a quote from someone I admire deeply – Brother Nathaniel A. Urshan. Brother Urshan was the General Superintendent of the United Pentecostal Church International from 1978 until his retirement in 2002. The Apostles were not mistaken. They believed it was the “last days” because it was. The Apostles wrote what they wrote under the inspiration of the Holy Spirit. It was the “last days” of the Old Covenant sacrificial system and the advent of the New Covenant. The old was sweep away being replaced by the new. It was the “last days” of the Levitical Priesthood. It was the beginning of the “royal priesthood” of New Covenant believers. It was the time of the cross of Calvary and everything that it represented. The Case for a Restored Nation of Israel – Scriptural Evidence for a Prophesied Return?